Tripawds in the news again! Mad Dr. Matt just mentioned me on KHSU and my people got all excited because I was in the paper and on the radio in one day! Yup, this pup was featured in today’s San Francisco Chronicle story about happy three legged dogs! A while back, my people were interviewed for this piece about a couple Greyhound rescue dogs – Kit Kat and Ozzy – who are loving life on three legs. 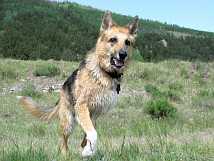 We ended up getting a great write-up about the health tips, resources and discussion forums we have here on this site for human companions coping with canine cancer and amputation for their furry friends. The article quoted doctors from UC Davis where I had my surgery over 18 months ago, and even mentioned how people can help three-legged dogs get around with the Ruff Wear harness my people use with me. The writer sent us the link to the online story this morning. Then we heard from our friend Chris who said he’d send us a copy of the print edition. And just now when my people called in a request to Alternative Therapy, the mad doctor himself remembered us and I heard him mention “Jerry the three legged dog…” So overall, it’s been a great day for canine cancer awareness. But then, every day as a three-legged cancer survivor is a great day. Three-legged Barnaby needs a home! Congratulations, Jerry! Great article! I have printed it out and am taking it to the vets to read! And, I really like the photo posted above of you! A terrific “action” shot! !